Photos from The Smithsonian’s Hall of Extinct Monsters (ca. 1915) | Park View, D.C.
Triceratops skill. Photo ca. 1915, from author’s collection. I’ve long had an affinity for the National Museum of Natural History’s Dinosaur Hall. My love of the hall and its collection only deepened after I learned that the museum’s original “Dinosaur Hunter”, Charles Whitney Gilmore, lived here in Park View at 451 Park Road. Soon, on April 28th, the hall will be closing for a $48 million makeover that is long overdue. It won’t be completed until 2019, meaning the collections will be off view for the next five years. So, in addition to giving folks the heads up to head down to the mall and view the Dinosaur Hall one last time before it closes for a while, I’m sharing the following photos taken ca. 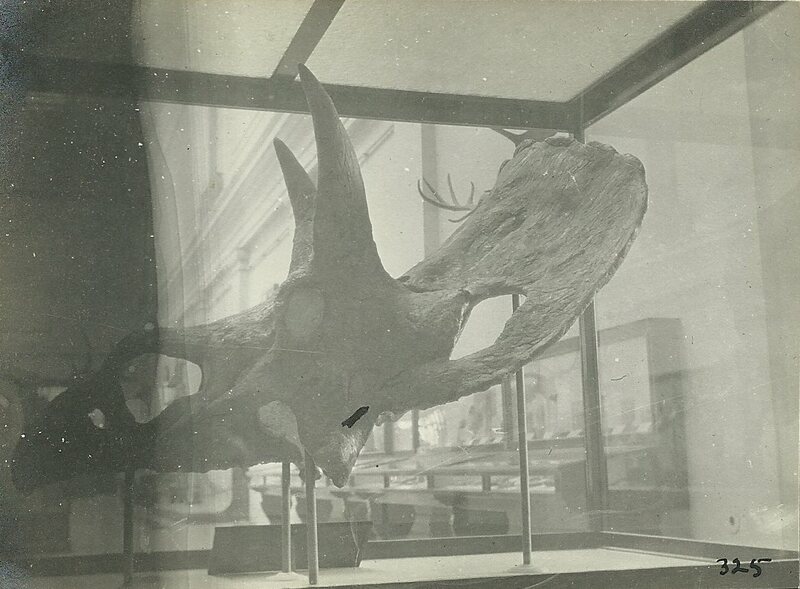 1915 of the Hall of Extinct Monsters, taken a few short years after the National Museum of Natural History first opened the hall to the public on October 15, 1911. Please note the photograph of the Triceratops skeleton which is particularly important to Gilmore’s story and his start at the museum. It was in 1903 Gilmore first received a contract to prepare one of the Marsh collection skulls of the horned dinosaur Triceratops for the museum and then was hired as a full-time preparatory in 1904. By 1905, with the help of preparator Norman H. Boss (who had just arrived that year and previously had also worked at the Carnegie Museum), Gilmore had mounted the skeleton of the Triceratops, the first skeleton of this dinosaur ever mounted for display. This entry was posted on March 6, 2014 at 7:01 am and is filed under Exhibitions, History, Science. You can subscribe via RSS 2.0 feed to this post's comments. Thanks for posting these photos! I’ve been looking into the historic fossil exhibits at the Smithsonian for awhile, but these were taken earlier than most available photos. Any chance you could share larger versions?